Each day I scroll through Google News and Reddit feeds for the latest information in the world of bitcoin, ethereum, and alt coins. Today I learned that Fidelity Investments, a major financial company [said to be managing $3 to $7 trillion], has been seriously dabbling in the world of cryptocurrencies. Those who closely follow Fidelity are likely aware that the company continues to exhibit increased crypto-friendliness. Recently, the CEO of Fidelity Investments (Abigail Johnson) attended a conference known as “Consensus” (2017) where she discussed Bitcoin, cryptocurrency, and blockchain technology. At this conference, Johnson highlighted ways in which Fidelity is relating to and interacting with the enigmatic world of crypto. What may have surprised attendees and/or those listening to her speech was the fact that Johnson mentioned Fidelity’s involvement in the mining of cryptocurrencies such as Bitcoin and Ethereum. Why is Fidelity Investments involved in cryptocurrency? What are your thoughts regarding Fidelity branching out into cryptocurrency territory? “We set up a small bitcoin and ethereum mining operation… that miraculously now is actually making a lot of money.” (Information attained from The Financial Times indicated that Fidelity purchased hardware from 21 Inc. specifically for this mining operation). Below are a few things we know about Fidelity Investments’ involvement in the financial realm of cryptocurrency. If you have any additional information that you’d like added to this list – mention it in the comments. CEO supports crypto: Abigail Johnson is unambiguous in her support for cryptocurrencies – she’s personally mined 200,000 satoshi (I’m not sure how long this takes to do – but based on the exchange, this would’ve earned her around $8 – not much). Johnson also made the decision to allocate some of Fidelity’s resources towards the mining of crypto via an experimental branch of the company referred to as “Fidelity Labs.” Furthermore, Johnson has mentioned the fact that she’d like to continue increasing the crypto-friendliness of Fidelity and iterated that she’s “a believer” in digital currencies. (This seems to be counter to another big financial CEO – Jamie Dimon). In her recent “Consensus” talk, Johnson encouraged the crypto community to work together to ensure that digital currencies continue to thrive into the future. Coinbase partnership: In August 2017, Fidelity strategically partnered with Coinbase, a company that provides services for the storage and trading of cryptocurrencies. Establishment of this partnership allowed Fidelity customers to actively monitor cryptocurrency investments within their portfolio – alongside mutual funds and stocks. Now, anyone with a Coinbase account can view their Bitcoin, Ethereum, Litecoin, etc. within their Fidelity portfolio. Though crypto trades cannot be made via Fidelity, many users are thankful that Fidelity now allows them to track their crypto assets 24/7. Crypto-friendly: Compared to most juggernauts in the investment industry, Fidelity is extremely cryptocurrency-friendly. The CEO is a cryptocurrency advocate, Fidelity users can monitor crypto investments 24/7 via their personal accounts, and the company has engineered a profitable mining operation. Adding to the company’s crypto-friendliness, Fidelity’s charity branch has been accepting donations in Bitcoin since 2015; throughout 2016 the charity received upwards of $7M in Bitcoin donations. To top it off, Fidelity employees can purchase lunches and coffees at the corporate canteen in Boston using Bitcoin. Rumor has it that Bitcoin enthusiasts employed by Fidelity are collectively nicknamed “Bitcoin Vikings” – in honor of their adventurous spirit (according to the CEO). Mining operation: Fidelity initially set-up a small crypto mining operation for educational purposes – to learn about and familiarize themselves with the crypto market. The CEO didn’t bother sharing the date at which the mining operation was initiated – nor the specific size of the operation (e.g. how much hardware they’re using). Moreover, the estimated earnings attained from the mining operation remain unknown to the general public. That said, it’s safe to assume that they’ve made some serious coinage… particularly after reading the CEO stating that the operation “miraculously now is actually making a lot of money.” Perhaps they will continue to expand the operation to a larger extent than competitors expect. Other crypto projects: Johnson stated that Fidelity Investments has begun other cryptocurrency-related projects. Most of these projects involve taking steps to maximize the [earning] potential of bitcoin, ethereum, and other digital currencies for Fidelity. While at this time, the specific details of these projects aren’t known, more information will likely surface. To sum it up, Fidelity is a massive financial firm that has taken a strong stance in support of cryptocurrencies like Bitcoin and Ethereum – as well as blockchain technology. One would speculate that if Bitcoin and/or other cryptocurrencies continue to grow, Fidelity will reap significant benefit – they seem ahead of the curve. There are numerous reasons as to why Fidelity would embrace the cryptocurrency market. Perhaps the biggest reason they’d want to get involved is because they don’t want to get left in the proverbial [cyber] – (or perhaps crypto) – dust. If Bitcoin and/or Ethereum continue to thrive, Fidelity stands to reap significant benefit – perhaps far more benefit than competitors who are late adopters. Other reasons Fidelity got involved in crypto include: demand (from customers), potential profits (via mining), unique selling point (other investment companies may not have crypto monitoring options). Adaptation: We’re living in an age of rapid progress, and according to some futurist extremists (e.g. Ray Kurzweil), the rate of progress will continue to grow exponentially. This means it’s necessary to adapt even more quickly to innovation than in the past. Crypto has gained serious momentum and Fidelity realizes that they must adapt to the times. Being an early adopter of crypto may ensure long-term survival of Fidelity and/or increased growth. Competition: Fidelity may be trying to win the crypto race against other investment firms. The quicker they provide cryptocurrency services, the more attractive they may be to prospective customers – thus taking business away from other companies. Moreover, organizing an efficient and profitable mining operation may be an effective diversification strategy for the company – yielding major profits. Demand: Some experts believe Fidelity is now letting users track Bitcoin investments via their accounts due to increased demand. Bitcoin has experienced massive growth over a relatively short duration whereby it has attracted many savvy investors. Because some of these investors attempting to capitalize on the volatile cryptocurrency markets are Fidelity customers – cryptocurrency tracking services via Fidelity were necessary. Diversification: Stocks, bonds, mutual funds, gold… oh and then there’s cryptocurrency. Over the past 8 years, Bitcoin has been the top performing financial asset – its value has doubled each year. Some speculate that Bitcoin may remain the top performing asset over the next decade. For this reason, a major company like Fidelity would be foolish if they didn’t strategically invest some of their money in cryptocurrencies. 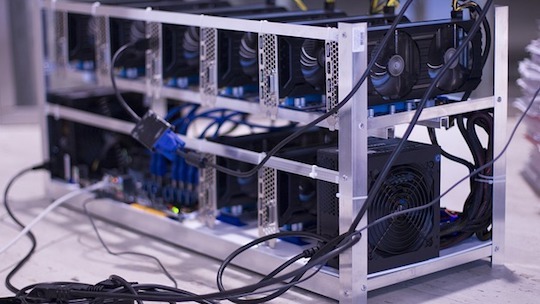 Profitable: Thus far the investment Fidelity has made in the engineering of a cryptocurrency mining operation has proven [highly] profitable. In fact, the CEO claims that they are “making a lot of money” from it. There’s potential for cryptocurrency to become even more valuable in the future. If Fidelity can continue mining a significant number of coins for profit – it’s a “no brainer” for them to remain involved. Uniqueness: I’m not sure whether other big financial companies are as crypto-friendly as Fidelity. My guess is that some are increasing their cryptocurrency services, however, they may be lagging behind Fidelity. This serves as a unique selling point for Fidelity – potentially attracting more cryptocurrency advocates as customers. I have a few final thoughts in regards to Fidelity’s involvement in crypto. Further crypto validation: After observing a major company like Fidelity allocate resources towards the mining of Bitcoin and Ethereum, as well as implement crypto tracking features for their customers, it’s reasonable to believe that this further validates the potential of cryptocurrency investments. Cryptocurrency skeptics may end up rethinking their position after seeing a juggernaut in the finance industry get their foot in the crypto door. The moves made by Fidelity in the cryptocurrency world indicate that digital currencies have entered mainstream consciousness. Low risk: For Fidelity, the risk of getting involved in cryptocurrency is relatively minimal. In fact, most would argue that the biggest risk a finance company could take is to ignore cryptocurrency markets. Fidelity partnered with Coinbase so that they could allow customers to track their crypto investments – no risk there. Furthermore, Fidelity has already turned a serious profit with their crypto mining operation. Even if popular cryptocurrencies like Bitcoin collapse – Fidelity will have made their millions. Fear of Bitcoin: Various large financial firms are increasing their cryptocurrency investments and conducting cryptocurrency experiments because they are afraid. Cryptocurrencies like Bitcoin are disruptive and aren’t fully understood – one expert is convinced they are frauds, yet others are convinced they are the future. The future of cryptocurrencies such as Bitcoin remains ambiguous. This ambiguity is scary for companies like Fidelity. Rather than ignoring the elephant in the room that is cryptocurrency, Fidelity is keeping its finger on the pulse via involvement. Do you suspect that other large-scale investment companies have engineered profitable cryptocurrency mining operations? If so, how much do you think each of these companies has earned to date solely from mining? In short, some may perceive this news of Fidelity’s stance on cryptocurrencies (e.g. Bitcoin) as a telltale sign that crypto will remain here for the long-haul. Others may perceive the implementation of crypto-monitoring services as an early step en route to mass Bitcoin adoption. Fidelity clearly endorses Bitcoin and crypto… will we begin seeing other major finance companies following suit? Only time will tell.